Hoping that each and every one of you is finding rest, joy and peace for your soul during this busy time of the year. It’s been an exciting time recently for Coaching: Life Matters. I want to share with you what we’ve been up to as well as let you know about an upcoming Core Story Seminar that you may enjoy participating in, taking place on December 1st, 2018. For the past couple of months, Coaching: Life Matters has been honored to join forces with an incredible prison ministry called Send Musicians to Prison. 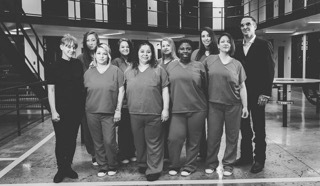 Our friend, Nathan Lee, who is the Director of Send Musicians to Prison, has welcomed Coaching: Life Matters into the heart of this ministry that provides encouragement and life skills to female prisoners here in Nashville, TN. Every Monday morning, I have been spending time with female prisoners, facilitating and listening to them share their Core Story. Alongside Joanna Lampa, who is the Coordinator of an eight-week Prison Academy (which provides Art, Bible Study, Financial Direction, Health and Fitness Support, Reconciliation and Conflict Resolution Support), we have been able to bring hope and healing to these ladies in a profound way. It has truly been a miracle to witness these ladies discover how valuable and beloved they are by their Creator, no matter the choices or circumstances that have shaped their life’s journey. And, isn’t that true for all of us? When we discover how beloved we are to our Creator, miracles can happen. Many of you may be familiar with one of Coaching: Life Matter’s favorite resources, which is a book written by my friend Jim Woodroof, Sayings That Saved My Sanity. This past September, Send Musicians to Prison hosted a concert for 50 prisoners who spent time studying Sayings That Saved My Sanity and learning about the Beatitudes. During this special concert, the prisoners shared their personal stories to 8 musicians who then wrote a song inspired by their story. This special concert was life-changing for all of those in attendance as we all witnessed how applying Jesus’ teachings can transform a person’s life and relationships. Soon, there will be a video of the concert. I hope you’ll take the time to watch it and be inspired and transformed: www.sendmusicianstoprison.com. Lastly, I want to let you know about a Core Story Seminar we are hosting on December 1st, 2018 at our office in Brentwood, TN. This seminar is open to those who are interested in receiving training on becoming a Core Story facilitator. If you would like more details about the event including registration cost, please contact Rebekah Gibbs at rebekah.corestory.life@gmail.com. Until we meet again, I hope that you are aware today of how deeply loved you are and how much your life matters! As always, we are so grateful for those of you who choose to pay it forward by supporting Coaching: Life Matters with your tax-deductible donations. If you are not set up as a monthly donor, would you please consider signing up today at donatelifematters.com? Every dollar counts and we depend on your generosity to continue our work.